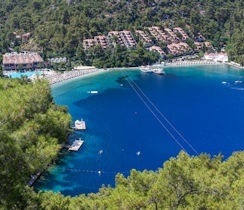 Located on the Turkish Aegean coast, within the privately owned Kalemya Bay, the Hillside Beach Club is a five-star holiday resort set within 24 acres of pine trees, fronted by blue-flag beaches and impossibly blue waters. With pools, SPAs, fitness centres, baby parks, three restaurants, and four private beaches, Hillside Beach Club has perfected the art of luxury holidays. Of the four private beaches, Main Beach is the family friendly one: a 330 metre sweep of small pebbles supplied with bars, cafés, and water sports. Serenity Beach, secluded away from the main complex and accessed by boat, offers – to adults only – an oasis of peace with a nature trail, snacks and cocktails. On Silent Beach, soothing quiet is guaranteed, with neither children nor mobile phones invited. The hotel also has its own 680m2 heated outdoor pool. Activities and games are regularly organised for both children and adults, making the pool area a lively and fun place during the daytime. A game of water polo, anyone? Hillside Beach Club ensures its guests are well looked-after, with all the little luxuries offered by two different Spa centres – Sanda Day and Sanda Nature. In the wooden rooms of the Sanda Nature Spa, located on Silent Beach, guests can treat themselves to a range of treatments and massages, including romantic couples’ massages. Sanda Day Spa, found within the heart of the resort, offers guests full use of the Jacuzzi, Sauna and traditional Turkish Hammam. The range of activities offered by Hillside Beach ranges from zumba to yoga, tennis to archery. You’ll also find canoeing, waterpolo, and scuba diving on offer. Plus basketball and table tennis for those who brought their trainers. 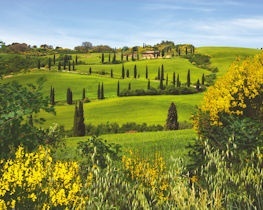 The hotel also includes its own Artiside Club where creative guests can enjoy artistic projects such as marbling, oil and watercolour painting, mosaic design, ceramic and wood craft, and jewellery making. 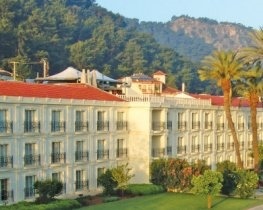 The Hillside Beach Club’s 330 rooms include free WiFi with some enjoying a magnificent sea view. 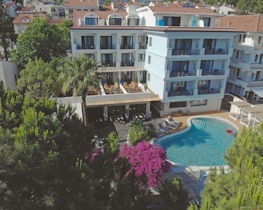 Superior rooms are 40 and 50m² in size, with large terraces, accommodating three to four children and adults. Double and Single rooms are also provided with the same comforts and can host two to three people. Families traveling with children will enjoy the activities offered by Kidside – where games and activities are specifically tailored for children from 4 to 10 years of age. The Young Club is great for teenagers from 11 to 15, where they can socialise and participate in DJ sessions, dance classes, and sporting activities. 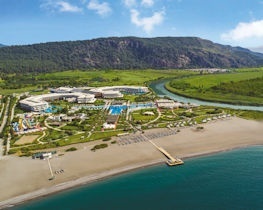 Located 55 minutes away from Dalaman Airport and 7 km away from the city of Fethiye, guests lodging at Hillside Beach Club are just an hour’s drive away from the ancient town of Tlos, with its mountains, tombs, trails, and hikes; from the museum city of Kayakoy; and from the 540km footpath of Lycia Way, a trail of Roman roads circling the Lycian coast favoured by trekkers. Due to the many steps around the hotel, it is unsuitable for those with mobility difficulties. For families including one parent and a child, or children, special offers are available. Contact our travel experts for details. 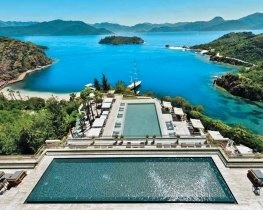 Hillside Beach Club has achieved Travelife Gold certification for sustainability. Offering all-round comfort, the Standard Partial Sea view rooms provide a tranquil environment in which to stay. The room comes with everything you could possibly need including plenty of storage space, air-conditioning, LCD TV, in-room safe, hair-dryer, free wifi, mini bar and telephone. Offering all-round comfort, the Superior Sea View rooms provide a tranquil environment in which to stay. The room comes with everything you could possibly need including plenty of storage space, air-conditioning, LCD TV, in-room safe, hair-dryer, free wifi, mini bar and telephone. Accommodation suitable for up to 3 adults. Offering stunning sea views and all-round comfort, the Superior Family rooms with a large terrace provide a tranquil environment in which to stay. The room comes with everything you could possibly need including plenty of storage space, air-conditioning, LCD TV, in-room safe, hair-dryer, free wifi, mini bar and telephone. The rooms consist of a large double room and a smaller room around a large private terrace. The smaller room contains two beds of 1.75 m and 1.90 m in length. A 20m2 room designed for single occupancy. Offering all-round comfort, the Single rooms offer a tranquil environment in which to stay. The room comes with everything you could possibly need including plenty of storage space, air-conditioning, LCD TV, in-room safe, hair-dryer, free wifi, mini bar and telephone. Offering all-round comfort, the Standard Park View rooms with a balcony offer a tranquil environment in which to stay. The room comes with everything you could possibly need including plenty of storage space, air-conditioning, LCD TV, in-room safe, hair-dryer, free wifi, mini bar and telephone. This buffet style restaurant presents an incredible variety of food choices for breakfast, lunch and dinner. With food cooked in front of you by highly trained chefs, this truly is the buffet to top all buffets. The head chef ensures the food is of the highest quality, guaranteeing that you are in for a superb culinary experience. There is food to suit every individual, with a plentiful salad section, a varied meat selection, copious desert choices and lighter food options for the health conscious. For a romantic candlelit meal by the water, Pasha Restaurant on the bay, offers delicious Mediterranean cuisine. Enjoy the carefully crafted meals on the a la carte menu, while you watch the fish swim past in the beautifully lit bay. With a variety of delicious Italian dishes available, this restaurant offers a stunning Mediterranean backdrop in which to talk the night away over a candlelit dinner. With the bar staff as friendly and professional as the entertainment team, they always have a smile on their face. During the day download the app on your phone, or press a button on your parasol, and the bar staff will deliver drinks and snacks to your sunbeds. In the evening relax at the bar and listen to soft music and the gentle sound of the sea. Hosting beach parties with live DJs and performances by the entertainment team, the Beach Bar provides the ideal place to dance the night away and test the spectacular cocktails and snacks on offer. Relax in the moonlight and make new friends in the lively atmosphere of the Pasha Bar. With the attached nightclub, this is the perfect place to show off your dance moves. Providing refreshing drinks and snacks during the day and music and comfy sofas in the evening, this bar offers a friendly atmosphere within which to talk the night away. The Abacco Bar provides cool indoor and outdoor areas in which to enjoy a drink and mid-afternoon tea. Take the shuttle boat over to serenity beach and make the most of the rustic Serenity Bar. With its tree trunk stools and fantastic range of drinks and snacks, the peaceful surroundings allow you to relax and take in the stunning surroundings. The main beach is the beating heart of Hillside beach Club. Offering many comfortable sunbeds, the beach provides the perfect place to relax and soak up the sun. If you get too hot take a dip in the calm, crystal clear waters of the bay to refresh. When you swim out to the pontoon remember to take googles so that you can observe the schools of fish that are usually swimming underneath. In the evening enjoy a cocktail on your sunbed as you watch the sun sink behind the hills and enjoy the soothing sound of the water lapping on the beach. Walk the nature trail or take the shuttle boat to reach this serene adult-only beach. With the sunbeds as comfortable as proper beds, and hammocks also available, this is the perfect place to while away the day in a peaceful environment. Take a seat on one of the tree trunk stools at Serenity bar and enjoy one of the many drinks or snacks on offer. For the ultimate relaxation experience, journey to the silent beach. This beach is a place where no talking or mobile phones are allowed, and therefore is paradise for those who wish to escape the noise of everyday life for a while. Slightly further round the bay from the main beach is the Pasha Beach. This beach offers the same pristine waters and comfortable sun loungers, but on a smaller scale than the main beach. Enjoy the large swimming area and make the most of the Pasha bar which is located just behind the sun loungers. The 680m2 heated pool is located just a few steps from the beach. The pool consists of three sections, a shallow kids pool, a shallow outside section that loops round the pool and then the main deeper section, where sports such as water polo can be played. This giant pool offers stunning views of the bay and is next to the pool bar where the bar staff are ready and waiting to make you a delicious, refreshing drink. Most evenings after dinner the entertainment team puts on a performance in the amphitheatre. The high energy, vibrant shows make you wish you had dedicated your life to dance as they have. There is also an incredible beach party where the water sports team show off their skills in a fantastic display of water sporting activities. On the rare night that the entertainments team take a break, other entertainment is put on, this may include the erection of a large cinema screen that floats on the sea for movie night, or a night of smooth jazz at the Abacco Bar. The Pasha nightclub provides the ideal place to make new friends and dance the night away. Watch the entertainment team liven up the dancefloor with their spectacular dance moves, and with a live DJ and fabulous bar staff the night never has to end. 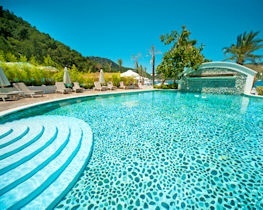 Hillside Beach Club is perfect for the active, as well as those who wish to do nothing at all. If you get tired of sunbathing on the beach or round the pool, there are a host of activities available to entertain you. The wonderful entertainment team at the Hillside Beach Club go above and beyond to make your holiday experience truly exceptional. Every member is an experienced and passionate dancer who are specially chosen for their magical, friendly personalities. Water sports: Water skiing, speed boat tours, ringo, sailing and diving, just to name a few. Artside: For those who wish to explore their artistic side, Artside provides the perfect range of activities including mosaic design, glass painting and jewellery design. For coffee enthusiasts, there is the chance to experience up close the art of artisan coffee-making. If you enjoy the art of cooking and wish to learn new methods and techniques sign up to the Cooking Workshop. Learn the art of making a range of exotic Turkish and international dishes. Learn a skill that will impress all your friends. Lead by Hillside’s mixologist, this workshop offers liqueur enthusiasts the opportunity to practice ‘secret recipes’ and learn the delicate art of cocktail making. The professional care service is available so young children can get the full attention they deserve, while the parents get some much-needed rest and relaxation. With a range of activities on offer, run by an experienced childcare team, your children will be entertained throughout their stay at the Kidside club. This allows parents to make the most of their holiday without having to worry about keeping the children entertained too. For teenagers, this club is the perfect place to socialise and make new friends. With a range of activities on offer, including DJ workshops and dance classes, there is no shortage of entertainment options to meet the needs of all those who join. Run by a highly trained team, the Sanda Spa provides the opportunity to relieve stress in both the body and mind in a restful and tranquil setting. Have a soothing massage and enjoy the whirlpool, sauna or a traditional Turkish Bath afterwards. Romantic packages are available for couples. If you fancy a boat tour this is the way to do it, the impressive boats that Hillside Beach Club runs for these excursions are beautifully laid out with sunbeds for the sun worshippers, plenty of shade for those who prefer to keep out of the sun and stunning views in every direction. Refreshments are also provided. The boat tours include: The 12 Islands Boat Tour, Sunset Tours, Private Boat Tours, Gulf of Fethiye and surrounding bays and Moonlight Tours. Culture and nature excursions: Kaya Köy, Dead Sea, Cadianda and Uzumlu. Adventure and sports excursions: paragliding, mountain biking, trekking, off-road jeep safari. Guests receive 30% discount on the beverage bill (excludes premium drinks, payable locally). for bookings made between 18 April 2019 and 03 April 2020 and arrivals between 15 April 2020 and 02 November 2020. Prices apply to all rooms. Guests visiting the hotel for the 2nd time receive a 15% reduction on food & beverages; 3rd visits receive a 25% reduction & 4th visits receive a 30% reduction (payable locally). for bookings made between 18 April 2019 and 02 November 2019 and arrivals between 18 April 2019 and 02 November 2019. Prices apply to all rooms. Honeymooners receive a complimentary bottle of local wine and a fruit basket in room on arrival, plus a 30% discount voucher for food & beverages. for bookings made between 18 April 2019 and 02 November 2019 and arrivals between 18 April 2019 and 02 November 2019. Prices apply to all rooms.